Rooms to Let at the Manners & Avenue House or..
A Victorian House with six spacious & elegant rooms. Avenue House is just a few minutes walk from The Manners. This beautiful Victorian House, sits prominently on Haddon Road at the head of The Avenue. 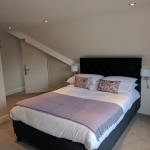 Avenue House was acquired by the team from the Manners in 2016 and it has now undergone a scheme of works which has refurbished and it now boasts six en suite letting bedrooms, over 2 floors. Avenue House is now open and ready for business where you can book the whole house accommodating up to 13 guests, or by the room. Please email info@mannersbakewell.co.uk with any booking enquiries. Boutique double bed, with padded headboard and deep luxury mattress.